As those long-awaited green shoots begin to grow and the first spring flowers begin to show, we can finally think about getting outdoors again. For many keen gardeners, that means enjoying their gardens and patios once more. If you’re looking forward to sipping your morning coffee al fresco or firing up the barbecue as summer approaches, take a look at these budget patio ideas. 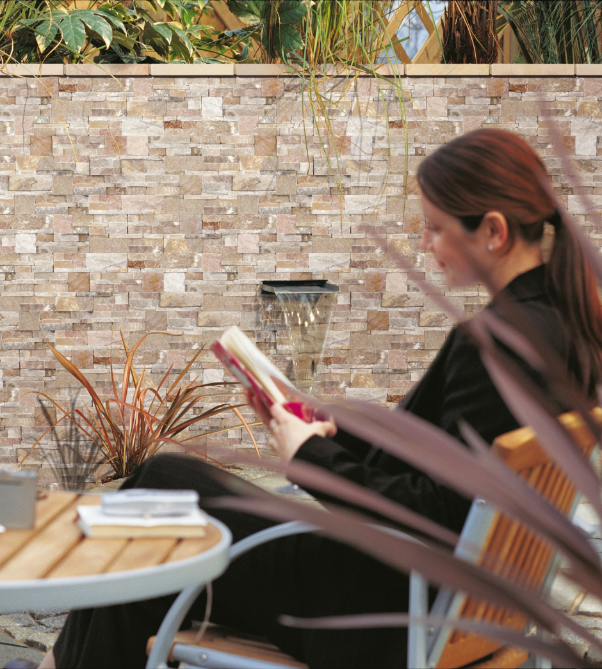 Create an aspirational outdoor space without breaking the bank and you’ll want to make the most of your patio, whatever the weather. What could be better than whiling away a warm summer’s morning with a book or some music and spending some time in your very own secret space? Arbours and arches are enjoying something of a renaissance right now, and with good reason. Cosy and romantic, they provide an excellent focal point without breaking the bank. They look their best covered with climbing roses or honeysuckle with a deep-scented bloom, and can be decked out with chairs or a bench to make a great outdoor living space. 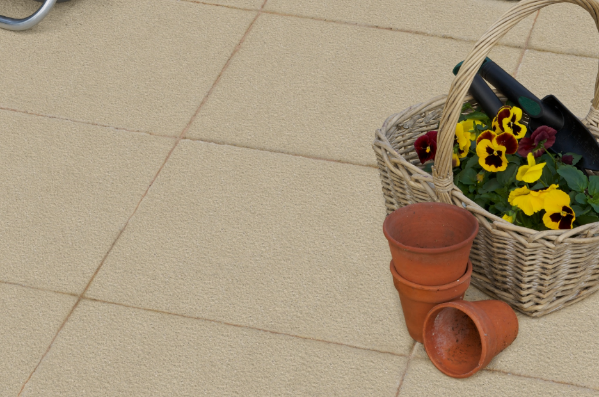 Perhaps the easiest and cheapest way to give your patio a quick boost, bedding plants provide a pop or colour – especially against buff and natural paving. Whether you go for pansies or you opt for swathes of violet lobelia, good old-fashioned begonias, prolific geraniums with their distinctive scent, or sweet busy Lizzies, you’ll enjoy a fast blast of vibrant colour to freshen up any patio. 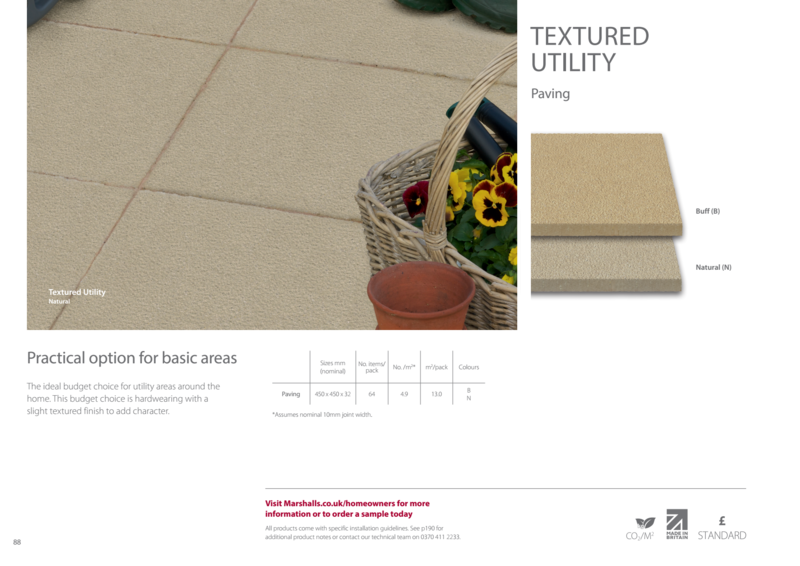 A surface like the Textured Utility Paving is a great idea if you want a cheaper paving option to contrast with your new florals. This planter is a fantastic example of how carefully selected plants can add softness and colour to a patio space. As well as being stylish, it is also practical as it’s being used to break up a larger area, adding colour and interest. Building up areas of your outdoor area like this is a clever way to use the space available to you, and an easy and cheap way to create interest in your garden, making a feature of the greenery as summer begins to emerge. 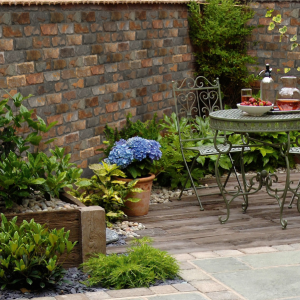 This is a homely, relaxing look for a patio and one that enjoys growing popularity, with good reason. Rustic, unfinished wood, warm pebbles and lightly distressed brickwork all work together to present a natural, unfussy aesthetic – a contrast to the sleek and modern trends of previous years. One way to enjoy the natural style with a product that’s easy to maintain and offers real durability is to opt for Woodstone sleepers. The hexagon shape at the centre of this geometric pattern defines the dining area. 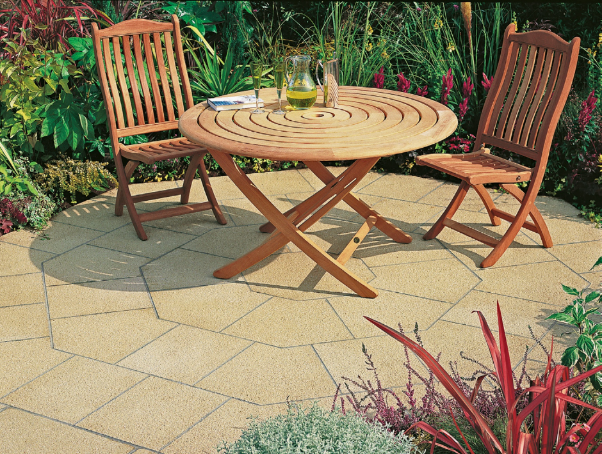 Using paving laid in a specific pattern like this is a great way to introduce a sense of quality to your patio, even if you’re using very affordable materials. 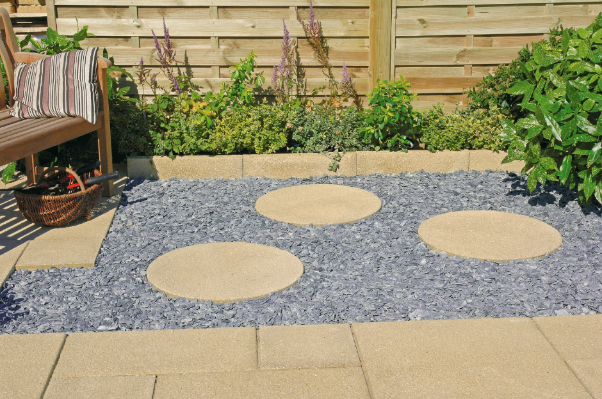 Patterns can be created ‘free-hand’ or pre-designed paving patterns like this Indian sandstone circle can be used for a sophisticated look on a budget. If your patio area is particularly small or you’re constricted by an adjoining wall, one answer is to make that divide your primary focus. Here, a very modern waterfall feature has been used within a stunning textured wall surface to provide a visual talking point. A feature wall could also act as the backdrop for dramatic wall planting, a bewitching light show, or even a series of apertures set elegantly in natural stone, which could be filled with plants or even the glow of lanterns. This energetic trend provides plenty to catch the eye. 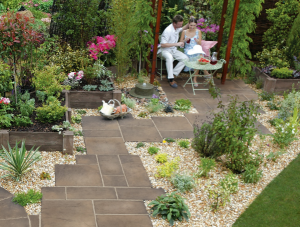 Planting at different levels and using a mix of paving sizes in a clever composition with a bit of creative flair provides an impressive and affordable outdoor space. 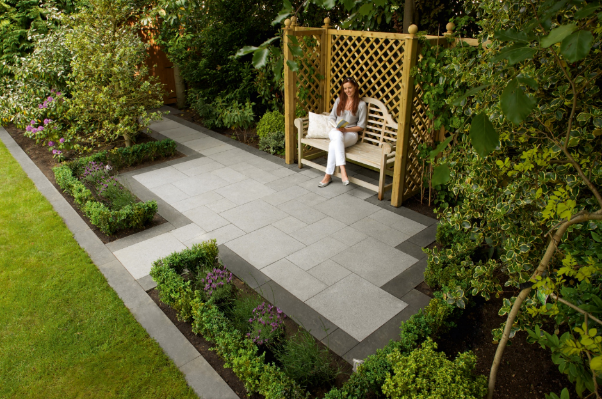 Choose a paving that’s available in a variety of sizes and/or colours to create extra interest and contrast. Richmond Utility Paving is one affordable option that can be used to great effect in a mixed media patio. When you’re think of garden patio ideas on a budget, gravel may not be the first material to spring to mind. However, with a little careful planning, you can use coloured gravels in innovative ways to define spaces, add interest and save money too. Here, slate chippingshave been put down and both the texture and colour of this natural stone work well juxtaposed against warmer contemporary paving. When it comes to budget paving ideas, taking the simple approach can still deliver excellent impact. This elegant patio uses outsize plant pots to punctuate the space. Best of all, this is a versatile way to work with your outdoor space. Swap out blooming pink camellias for space-filling ferns, or formal topiary, as your mood shifts from one year to the next. The right set of table and chairs can do wonders when you want to update your patio on a budget. 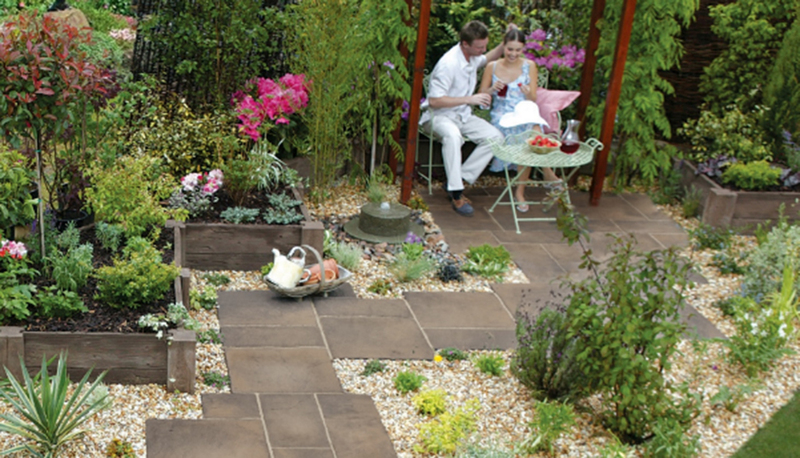 Combined with affordable ground cover, such as Pendle Riven utility paving, it can really revitalise a space. Whether you plump for ornate wrought iron for an Italian terrace feel, understated modern furniture for a parred back look, or something chunky and bold with lots of cushions for laidback evenings, the choice is yours. These cheap patio ideas are simply a starting point for anyone hoping to beautify their garden this year. 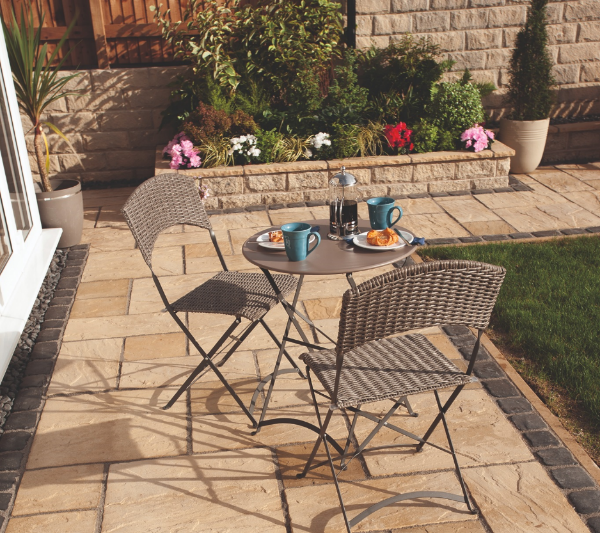 Whether you’re looking for practical guidance on patio tasks like how to cut paving slabs, or more inspiration on creating your best ever outdoor area, we’ve got it covered.